LG announced the Optimus L9 back at the end of August, when it took its place at the top of the L Series range, one dedicated to attractive, well-specced Android phones. It seems the L9’s good looks attracted an American suitor, as T-Mobile has let its intention to release the L9 later this year be known. T-Mobile swoons over the L9’s styling in its press release, gushing about its modern, square style and “floating mass technology,” a phrase we probably wouldn’t use to describe a loved one. The truth is, the L9’s minimalist design may not appeal to everyone, and the 9.1mm thick chassis isn’t all that svelte these days. The big 4.5-inch touchscreen is welcome though, even if its 960 x 540 pixel resolution doesn’t match up to many of its more expensive peers, and there is a capable 5-megapixel camera with an LED flash and 1080p video recording on the rear. Inside is a 1GHz, dual-core processor with 1GB of RAM, which may not sound that impressive in these heady quad-core times, but it’s a considerable step up from the Optimus L7. LG has blessed the L9 with Android 4.0 Ice Cream Sandwich, but doesn’t mention anything about an upgrade to 4.1 Jelly Bean, however news could follow its release. A sturdy 2,150mAh battery should provide lengthy standby and talk times, although no official data has been released. Other features include LG’s QuickMemo software, DLNA connectivity, Dolby Mobile, Wi-Fi Calling, Bluetooth 3.0 and for the camera, simultaneous still and video capture, plus the bizarre “Cheese” mode, where the phone takes a snap when it hears someone say “cheese.” Yes, really. 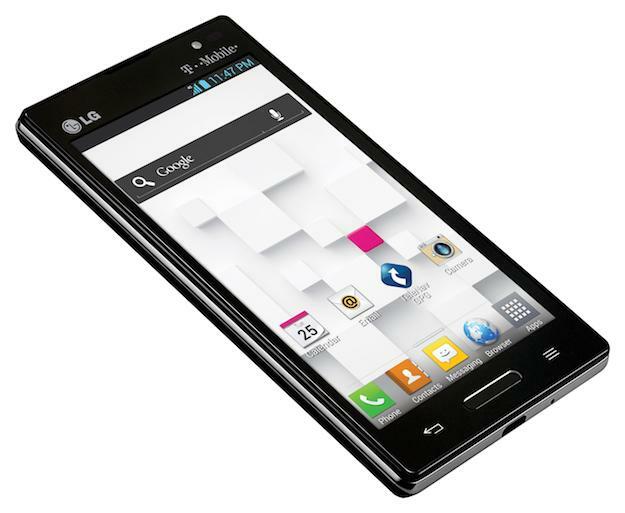 The Optimus L9 will connect to T-Mobile’s HSPA+ network and will go on sale later this year, but no exact date or information on pricing has been revealed. It joins the Nokia Lumia 810 as the second new device announcement from T-Mobile this week.